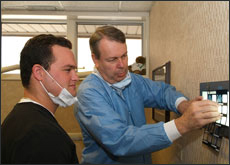 Your first visit to our office establishes a vital foundation for our professional relationship with you. During your first visit, we strive to obtain important background information, such as your medical and dental histories, perform a detailed examination to assess your current dental condition and allow you time to get to know Dr. Hogan and your hygienist. To understand what to expect at your first visit to our practice, please read through this page. You will find background information about our dedicated staff, first visit procedures and all the practical information you need, such as a map and directions to our office, practice hours, payment and insurance policies and more. You can even save some time at your first visit by printing out and completing the patient forms in advance of your appointment. SPECIAL NOTE: IF YOU HAVE A HEART MURMUR, ARTIFICIAL HEART VALVES OR HAVE ARTIFICIAL JOINT IMPLANTS, PLEASE NOTIFY THE OFFICE IN ADVANCE TO SPEAK WITH DR. HOGAN REGARDING PRE-MEDICATION PROTOCOLS. From Pace Bus Route #290 Touhy Avenue Stop at Washington.